Sarah Palin served up a treat for a group of private school students in Pennsylvania on Tuesday night, in an attempt to teach them the virtues of limited government. During a paid speech at a fundraiser for Plumstead Christian School in Plumstead Township, Pennsylvania, the former Alaska governor announced she brought cookies with her, local station WPVI-TV reports. "I brought dozens and dozens of cookies," she said. "I had to shake it up for you guys, especially the press okay." As she Tweeted earlier in the day, Palin wanted to "intro kids 2 beauty of laissez-faire via serving them cookies amidst school cookie ban debate." She called it "Nanny state run amok!" She was referring to a future vote the Pennsylvania Board of Education will take on new guidelines to limit the number of sweets allowed in classrooms. "I look at Pennsylvania and I think of sweets - I think of Hershey. Then I think, how dare they ban sweets from school here?" Palin said. "Who should be making the decisions what you eat, school choice and everything else? Should it be government or should it be the parents? It should be the parents." 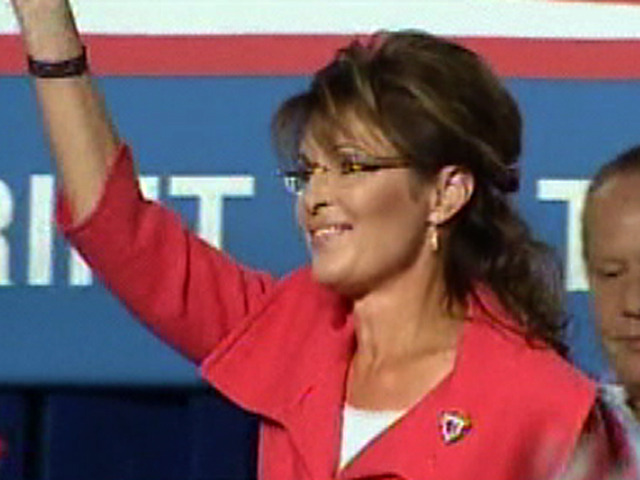 Palin also teased her audience about her potential future presidential bid, the Philadelphia Inquirer reports. After a school alumnus sang "God Bless America," Palin asked, "Would you like to sing that at an inauguration?" When the school's chancellor asked if she would consider running for president, Palin said, "Goodness gracious. I'm speechless." If she were to run, Palin said, "I would be in it to win it. I wouldn't do it just to shake things up." Stephanie Condon is a political reporter for CBSNews.com. You can read more of her posts here. Follow Hotsheet on Facebook and Twitter.